About a dozen of us huddle in a tiny room of a resident that evidently doubles as Charkudih's clubhouse. A card game is in abeyance. A grimy table fan awaits electricity. A battered black and white TV set is hooked up to a small battery, both dead. A calendar of a brick-making firm is turned to September. Locals say there hasn't been any public meeting to discuss the project. They first twigged on to it last year when some local land agents started visiting landowners-farmer-owners of tiny plots to landlords-with a simple message: jameen bech do (sell your land). The price: '5 lakh an acre. When villagers queried the purpose, they received evasive answers. A few have sold land to agents-villagers share their names-but when they queried the local revenue officer in whose names the purchased lands have been registered, they were shooed away. Distrust and resentment now accompanies confusion. On 31 August, some villagers of Charkudih saw a couple of cars arrive. Soon they saw people walking around their lands. Upon asking the drivers, they learnt that representatives of the company were conducting preliminary surveys for a railway line to the proposed plant. When villagers lost their temper, questioning the presumption of the survey-nobody had asked them for their permission-the visitors fled, and complained at the local police station. Villagers tell me they initially heard that the local police bara babu (senior officer) would arrive to arrange a samjhauta (understanding) between residents of the 15 villages and the company. Instead the police arrived on 1 September and roughed up four Charkudih villagers and accused them of being members of MCC, short for Maoist Communist Centre, as the Communist Party of India (Maoist) is still known by its pre-merger element in these parts, a three-hour drive south-east of capital Ranchi. A group of villagers now plan to use the Right to Information law to extract information. They fear the company, with active collusion of government agencies, is seeking to circumvent provisions of the Chotanagpur Tenancy Act that in Jharkhand restricts sale of land owned by tribals, those of scheduled and other backward castes-as is largely the case in Sonahatu block. Certainly, villagers have heard political spin that targeted land in the 15 villages is described as banjar (unproductive land) when nearly all of it either produces more than one harvest or is used for grazing. The document in my possession marks nearly all targeted land as productive. A fear of loss of livelihood accompanies anger in Charkudih and nearby villages. 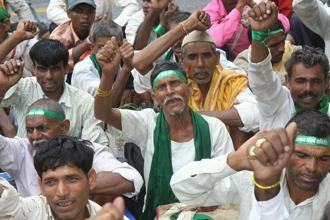 Jharkhand's appalling record of resettlement and rehabilitation is firmly imprinted here. Locals ask me how a one-time payment of '5 lakh an acre will compensate for farm income that would fetch an equivalent amount in three-five years. Besides, nobody has bothered to tell them what kind of livelihood they might have in an industrial situation. Jharu lagao, nahin toh niklo, a villager spits out: We shall either become sweepers (at the factory) or have to leave. I begin to tell them about an interview I read recently in a news weekly, where the president of lobby group Confederation of Indian Industry mentions that farmers need to invest earnings from sale of land in stocks, because "land has the lowest appreciation of all assets" and "somebody should advise them to invest it in mutual funds". The farmers look blank. And here I am: Marie Antoinette of Charkudih. Sudeep Chakravarti is the author of Red Sun: Travels in Naxalite Country and Highway 39: Journeys through a Fractured Land. This column, which focuses on conflict situations in South Asia that directly affect business, runs on Fridays.